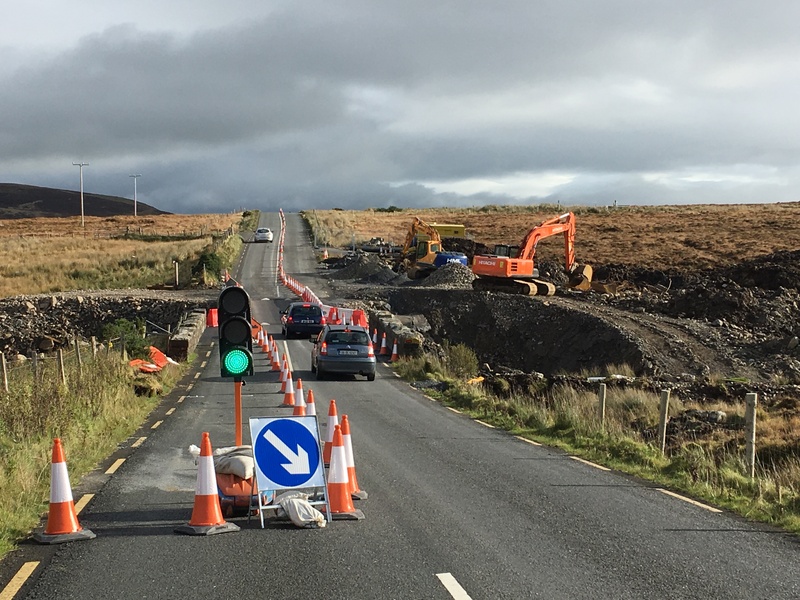 The Mountain Road, between Carndonagh and Drumfries, has re-opened to traffic some 6 weeks after a key bridge was destroyed in The Flood. All of Inishowen’s main routes are now open, or at least partially open, seven weeks after the floods of August 22 hit the peninsula. The Carn Mountain road was the latest and last main regional road in Inishowen to reopen last Friday, 6 October, to single lane traffic only. The road will remain governed by traffic lights for the next number of weeks with temporary ramps also put in place. Carn Councillor Albert Doherty said the reopening of the Carn Mountain will save motorists, who had to take the ‘circular route’ around Clonmany and Ballyliffin, a lot of miles. He said the expect the culverts needed to finish the Carn to Buncrana will soon be available and the road will be fully reopened within the coming weeks. Meanwhile the Quigley’s Point to Carn road also remains open to single lane traffic only, and engineers have been working around the clock to repair the road. More in this week’s paper.